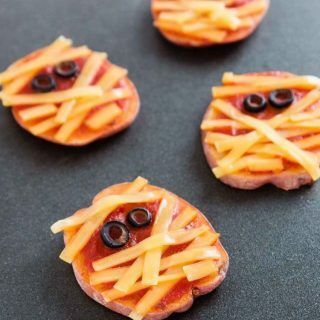 These mini Halloween Potato Pizza Mummies are the perfect Spooky, but easy and healthy, bites for Halloween night! Preheat the oven to 400 degrees and line a baking sheet with foil (note: for a smaller serving size you can also use your toaster oven). Slice the potatoes lengthwise into 1/4-1/2 inch slices. Set both end slices aside. Place the remaining slices in a single layer on the lined baking sheet. Quickly spray a little cooking oil on the potato slices and sprinkle with salt and freshly ground pepper (if using). Bake in the oven for about 10-15 minutes until the potato slices are tender. Bake for longer if needed. Remove from the oven and flip each potato slice over. Spread a layer of your favorite pizza sauce on top of each potato slice. Arrange the sliced black olives as eyes and the vegan cheese strips to form the mummy (see picture above). For a spicy version, sprinkle on some red crushed pepper on top of the pizza sauce and use sliced jalapenos for the eyes. If you do not care for the mummy look, feel free to add any other veggie pizza toppings!